Hello and happy Thursday. We're back with your regular progress report on EDGE Pipeline 2! Head over to our new Forums to vote on ideas or add your own! Be sure to "Follow" forums that interest you so that you get notified about new posts within them. Search Form - Added "Body Style" Filter! Be sure to head over to our new Forums to vote on ideas or add your own! Some cool ideas are gaining popularity over there! That's it for this update. Have a great week! Happy Monday, we hope your week is off to a great start. We're back with your regular progress report on EDGE Pipeline 2! As always, we encourage you to share this with your staff and customers however you see fit. Head over to our new Forums to vote on ideas or add your own! Be sure to "Follow" forums that interest you so that you get notified about new posts within them. This update addresses a few things in Search. More Search changes are coming, thanks for the feedback! 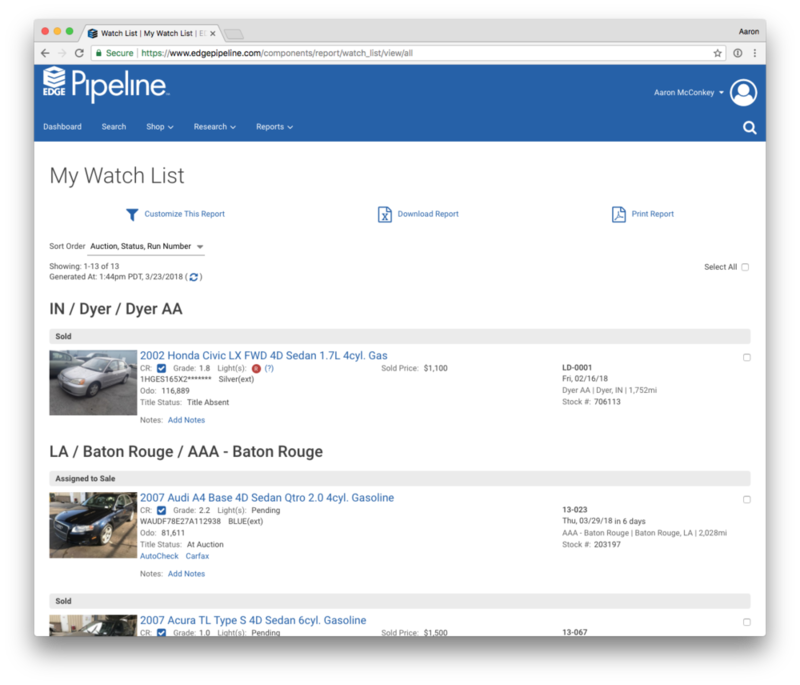 Ongoing development on a new sales channel / event type for auctions to be able to list vehicles on EDGE Pipeline. This is where much of our efforts were focused on in this last iteration. Be sure to head over to our new Forums to vote on ideas or add your own! Happy Star Wars day! May the 4th be with you. We're back with your regular progress report on EDGE Pipeline 2! As always, we encourage you to share this with your staff and customers however you see fit. Continued work on a new sales channel / event type for auctions to be able to list vehicles on EDGE Pipeline. This is where much of our efforts were focused on in this last iteration. Modal Forms with multiple submit buttons don't detect the correct button clicked in "all" browsers. Richmond AA: Show actual mileage versus "Exempt"
Clean up AAA Atlanta's duplicate lanes e.g. "A" vs. "A "
That's it for this update. Have a great weekend! Happy Friday! We're back with your regular progress report on EDGE Pipeline 2! As always, we encourage you to share this with your staff and customers however you see fit. My Watch List (and other dealer reports) design revamp - based on dealer feedback, we have added some new sorting options along with a nice visual grouping of listings by Auction and status. Xcira OLR - a bug related to turning lights off if they were already sent to OLR "on"
This is our currently planned work, but it's always shifting & changing! We're back with your regular progress report on EDGE Pipeline 2! As always, we encourage you to share this with your staff and customers however you see fit. Also sure to head over to our new Forums to vote on ideas or add your own! My Watch List items (and notes!!!) now sync with EDGE Simulcast, so buyers get notifications within EDGE Simulcast about watched items again! There were 2 Odometers in "Customize This Report"
That's it for this update. Have an awesome week! The EDGE ASI team is here to announce a change to the way Frame Damage disclosure works (and how that displays online in EDGE Pipeline / EDGE Lookout). This change applies to both EDGE Mobile ASI & CR Input and is LIVE at your EDGE ASI auction now. Previously, EDGE ASI supported an On/Off checkbox for Frame Damage. "On" meant there was indeed Frame Damage, and "Off" meant the Frame was good. There was no way easy & dependable way to say that the frame was not checked at all. This means that auctions that never checked the frame were advertising them as "Frame: Good" on EDGE Pipeline / Lookout... which is obviously problematic. As of this week, the "Body & Structural" checkbox will imply a frame check has indeed been performed. Conversely, if you only perform a visual check of the vehicle on no frame check, then only check the "Visual" checkbox. Anytime "Visual Frame Damage" is checked, EDGE Pipeline says "Frame : Damage"
IF "Visual Frame Damage" is not checked, and "CR Completed for:" has Body & Structural set to TRUE, EDGE Pipeline says "Frame : Good"
Written out that way, it may seem a bit daunting. However, when you think through the common scenarios, it actually is a lot more intuitive now. Let's say I didn't do a frame check on a car at all. I'd not check the top "Visual Frame Damage" box, and say "CR Completed for: Visual". On EDGE Pipeline that would say "Frame: - -". On the next car, let's stay you checked the frame and it was good. I'd not check the top "Visual Frame Damage" box, and say "CR Completed for: Body & Structural". On EDGE Pipeline that would say "Frame: Good". Any time you check the top "Visual Frame Damage" box, EDGE Pipeline will say "Frame: Damaged". Thanks for reading! We hope you find these changes to be useful. Let us know what you think in the comments below! Here's your regular progress report on EDGE Pipeline 2! Bug - Buy Now listing is missing cart, and Watch List are out of date. These both are is related to the same bug. If you don't see your favorite request on this list, fear not, we know there is more; these are just the current top 10, and the top 10 is always changing. We are excited to say that we are very close to implementing our new online Forums, where you the auctions, can discuss and vote on features to help with prioritization. In the meantime, feel free to email your top priority issues. That's it for this update. Have a great weekend all! This is your regular progress report on EDGE Pipeline 2. Let's catch you up on what's been happening. Simulcast Report, Sale Monitor, and Bid Log Report are all now fully up-to-date all the time (very near real-time)! No more lag on that data that you need on sale day. This is a long post, but we've got a lot to catch you up on! This is the beginning of a new regular communication that we'll be doing about our continued progress in the evolution of EDGE Pipeline. While this email is "auction centric", we're also planning to poll your dealer community for their feedback on features/issues, so keep an eye out for that (you'll be on that email as well)! Today EDGE Pipeline 2.0 is exactly 6 weeks old! It's been a little while since we last wrote you, but we've been hard at work on EDGE Pipeline even since the launch. We've made a lot of progress over the last 6 weeks, and we know we have so much more to do. Our foot is firmly on the gas pedal and we're working as quickly as we can to address your change requests, missing features, and issues. When an AA dealer re-syncs Handshakes, still make the added AA rep option available even if the auction did a manual handshake. Text Search add support for engine displacement like "4.7" or "6.6"
Faster log imports for EDGE Admin Reporting to be real time, instead of "the day after"
If you don't see your favorite request on this list, fear not, we know there is more. The list has 228 outstanding items at the moment; these are just the current top 10. We are working on implementing a system where very soon you, the auctions, can vote on features to help with prioritization. In the meantime, feel free to email your top priority issues. We know the site has many opportunities for improvement, and we're getting there. The tricky part is getting those 228 items in the right order, which is why we're polling dealers and listen to you (our auctions) constantly. Your continued feedback is so important, so thanks for that. The Auction Edge team is very excited to announce a massive update coming to the EDGE Pipeline product. In fact, this is not really an update as much as it is a complete migration to an all new system. Read on to see what’s coming with the new platform, why you need to create a new user account (or merge if you already had an EDGE Lookout user), and what you can expect in the future. 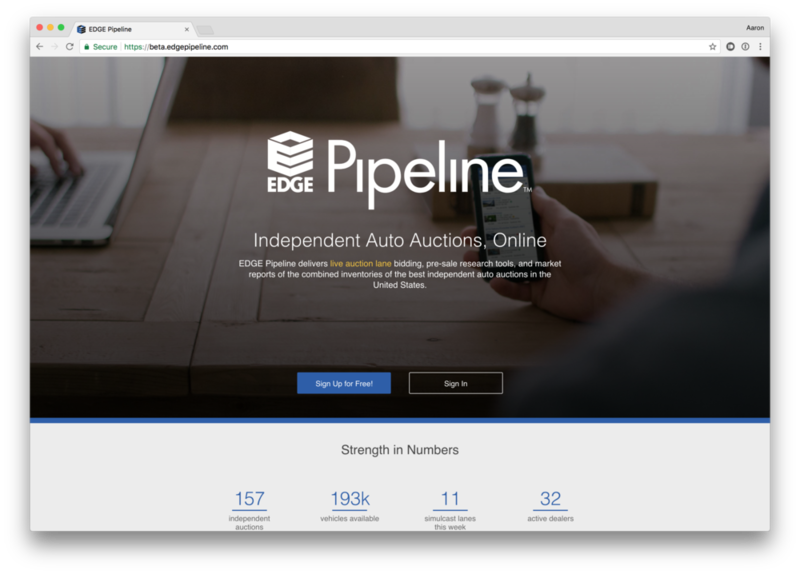 EDGE Pipeline is the national wholesale marketplace of the Independent auctions. It is a platform for buyers and sellers to manage their auction life on the go, find new inventory, or reach new buyers. In the December update we are bringing new ways to do all of these things with less friction and more accessibility on all types of devices. The December release is really a migration to an entirely new system. Under the hood, EDGE Pipeline will now be sharing many of its services and components with our EDGE Lookout product. If you are a dealer or consignor who logs into an auction website to search vehicles or get reports, it’s likely an EDGE Lookout website. Moving forward with the December release, you will have a single unified account across all Auction Edge websites and online products. In order to achieve this, you’ll need to create an account on the new system. If you already sign into an auctions EDGE Lookout site, then you already have an EDGE Single Sign On account! However you’ll still want to sign into the BETA and make sure all of your Handshakes are in order. If you have any account registration issues, contact the Online Sales Coordinator at your local auction house for assistance. This is the beginning of a new era for EDGE Pipeline and Auction Edge as a whole. Moving to this new platform means our team will be able to deliver new features and innovations at a much faster pace, so we are really excited about some of things slated for 2018. We’re not quite ready to share what’s coming around the corner, so stay tuned to the blog here let us know what you think in the comments below!